6 Tips To Avoid Phishing Attacks – Don’t Click On Strange Links! The first phishing giveaway is often the sender’s e-mail address. Even if the e-mail itself looks legitimate, that address often stands out as being questionable. For example, if you receive an e-mail from Apple AAPL +0.32% and the sender’s address is AppleSupport765@hotmail.com, this is clearly not really from Apple. The objective of a phishing attack is usually to get you to download an attachment or to click on a link. Use extreme caution with attachments –they can be disguised malware that will infect your PC. Don’t click links within an e-mail that you are at all suspicious of. What looks like a legitimate hyperlink can be a disguised link to a criminal website. When in doubt, hover your mouse over the text of the hyperlink (you should see the full URL, which will help to show whether it leads to a legitimate website) or better yet, open a browser window and manually type in the hyperlink yourself to prevent it being re-directed. Sometimes the bad guys pull things together and manage to generate a spear-phishing campaign that’s really difficult to detect. The e-mail appears to come from a legitimate source, it references something that could be legitimate (like a recent purchase you made) and it’s polished and official looking. If you’re not expecting this e-mail, pick up the phone and call the originating company’s customer service, or send an e-mail directly to their customer service to verify they sent it. As an added layer of defence, security software is never a bad idea. Some Internet security packages have a feature that automatically detects and blocks fake websites, adding a failsafe in case you accidentally click on link you shouldn’t. And it goes without saying that you should be using a unique password for each website where you are required to log in. If you’re a phishing victim, this can help to contain the damage. If however you do find yourself victim to an attack please RESET your email password. Comments Off on 6 Tips To Avoid Phishing Attacks – Don’t Click On Strange Links! You can ensure that you are using the latest resources that we have provided to help with this issue by referencing the CTF 17/18 Import Contact Issue Key Documents Hot Topic. The following SQL database script can be run against a SIMS database to identify which users have ticked the CTF incident informational splash screen (please see the below screen print). The SQL script should be executed at the database management system (DBMS) layer as it is not a part of the SIMS application. The output will identify the last CTF import and export dates as well as which user has acknowledged the CTF splash screen. Please see the below example. Alternatively the Diagnostic_tool_and_Diagnostic_Script can be employed to generate the same output. Please follow these instructions when using the tool. It is important to run Tools | System Diagnostics | Database Diagnostics after applying the Workstation Patch as indicated in Step 2 (of the 4 step process) described in the CTF Issue document. This is true even if Database Diagnostics has been run previously. Check 99 is improved by the Workstation Patch and is likely to report a slightly wider range of possible issues to check and improved information to dealing with the possible issues. You will find that much of the advice that help desks are able to offer will be contingent on Database Diagnostics having been run after application of the Workstation Patch. We understand that CTF files for Pupil ULNs are now available from S2S in the correct 2018 format. Using CTF Import to import CTF files for Pupil ULNs has no significance to the CTF Import contact issue, except that school will need to have indicated that they have complete dealing with the CTF Import contact issue before import of CTF files is available from SIMS. This PowerPoint presentation is available from our Row 03 of the CTF Key Documents Hot Topic. This presentation illustrates how Excel can be used to view a CSV file created from the output for check 99 in Database Diagnostics. This is made available via the application of the workstation patch for either the SIMS Spring Release 2018 or the SIMS Summer Release 2018. We ask that all schools makes use of this latest check 99 to ensure that all issues created by the incident are identified so that they can be addressed. A restricted version of the Data Collection sheet for student contacts only has been created in response to customer requests. This Data Collection sheet will populate with basic student details and then provide blank spaces for parental/emergency contact information. This report is helpful if schools wish to provide a simple form for parents to complete to gather or check emergency contact information. The report needs to be imported into SIMS via Reports | Import – Data Collection (Contacts Only).rptdef. Once imported, you can access the report via Reports | Run Reports | Student to produce for multiple students, or via the Reports link within the student record for an individual pupil. For Capita Hosted SIMS schools the report will be imported for you by COP Tuesday 11th September. This report definition file is available from the CTF 17/18 Import Contact Issue Key Documents Hot Topic. Where schools provide information to local authorities, schools should inform their local authority once their SIMS data has been corrected (or inform their local authority that their school(s) was not impacted). It is also advised that schools inform any third-party partners which may use their SIMS data. Please note that administrative access is now available for options online where verification against the CTF incident is still outstanding. This provides suitable access to carry out the administrative tasks that are necessary at this time of the year. Full access is resumed once your school indicates that the contact data involved with CTF Import incident has been checked and (where appropriate) remedial action taken. 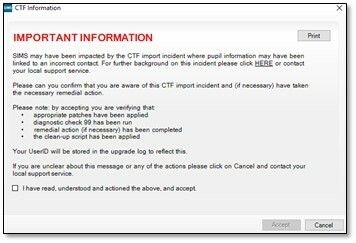 We have ‘pinned’ a CTF Key Document Hot Topic to the top of the Hot Topic panel in My Account to help schools with the CTF 17/18 contact incident. This will stay in place while schools are dealing with this incident and we will ensure that it provides links to the most current versions of the key documents. Click here to download a PDF document that answers questioned posed on the CTF 17/18 Import Contact Issue forum thread. This is our fourth version of this document and can be taken to be our view on the 04/09/2018. We intend to update the document as necessary in the future. All answers will make it clear as to what date we had the view expressed. We understand that the CTF files provided via S2S for adding the ULN (Unique Learner Number) for learners is still in CTF 16 format. This format is no longer supported for CTF Import. The DfE will be dealing with this matter shortly, but for the moment we must caution against making manual changes to the file names and content of CTF files to ‘trick’ CTF Import into accepting them, as the formats for CTF 16 and CTF 18 are not compatible. Please see the normal ‘SIMS Newsfeed – CTF 18’ for any further updates in this area. This PowerPoint presentation is available from a ZIP Click the Link CTF_Import_-_Using_Excel_to_view_the_revised_Check_99_report_pptx. This presentation illustrates how Excel can be used to view a CSV file created from the output for check 99 in Database Diagnostics. This is made available via the application of the workstation patch for either the SIMS Spring Release 2018 or the SIMS Summer Release 2018 (intended release on 17th August 2018). Application of either of these patches provide improvements to the original check 99. Filenames changed so the that they are the same a those used in the latest ‘How to ..’ document. Scenarios added to the end of the presentation in line with the latest ‘How to ..’ document. Section added at the start to describe the mechanics of copying output from Check 99 to a CSV file ready for opening as a spreadsheet. Please note that a variant of our ‘ How to Identify and Correct Data Impacted by the CTF Import Incident’ document, for use by Capita hosted SIMS 7 customers, is available from here. A PDF document with screenshots captured from SIMS after the workstation patch has been applied is now Resource ID 6503. Version 2.0: Filename changed to CTF_-_Screenshots.pdf and version number added to footer. Version 3.0: Further explanation added. A document that answers questioned posed on the CTF 17/18 Import Contact Issue forum thread. This is our first version of this document and can be taken to be our view on the 21/08/2018. We intend to update the document as necessary in the future. All answers will make it clear as to what date we had the view expressed. We have released a new workstation patch today following a recent investigation to ensure all potential defect scenarios are captured. Spring 2018 workstation patch 1 – CTF Import & Check 99 Improvements. Summer 2018 workstation patch 1 – CTF Import & Check 99 Improvements. Capita hosted SIMS customers are already on the SIMS 2018 Summer Release (7.182) and therefore the “Summer 2018 workstation patch 1” will be applied on Friday 17th August 2018 outside of working hours. Does the workstation patch need to be applied? If your school does not use the CTF process the school will not be impacted (this can be checked in SIMS CTF log, from Routines | CTF Import | View History Log). The school will not need to take any further action. In all other instances the workstation patch should be applied. Once the correct workstation patch has been applied the new diagnostics within the patch must be run and remedial action taken. Please READ HERE for a detailed description this. Please note: Even if you have previously cleaned the incorrect contact merge data (based on advice received in July), this patch will identify potentially more incorrect contact information which needs to be addressed (i.e. contacts not at the same address). We have purposefully not provided access to the new diagnostic script by default to Support Units. This is to ensure the new workstation patch (above) has been applied first. Once the new patch has been applied you can request access to the script from Capita SIMS Service Desk. Several SIMS modules access and use contact information from SIMS. We therefore have taken the proactive precautionary step for impacted SIMS modules as previously published (see also a summary below). From Monday 20th August schools will be able to directly reactivate SIMS Online Services and Agora from their respective administration sites and therefore easily reinstate product functionality. Schools will be asked first whether they have completed the data clean-up and will need to acknowledge they are happy to reactivate the service. Schools should only use InTouch (SIMS text an email module) for generic communications to parents and contacts. Any communication which contains specific pupil information should not be sent until the schools are confident they have validated their student contact data. New splash screen notifications with acceptance buttons has been included in the SIMS7 workstation patch to ensure all schools are aware of the incident and have taken the necessary action to address potentially incorrect data. The splash screen references this document for background information and guidance on how to undertake the necessary remedial action. If you have any questions about the content of this communication or would like additional detail, please contact the Capita SIMS Service Desk. This PowerPoint presentation is available from a ZIP RESOURCEID-1-6464. A more focused search eliminating some of the near duplicate lines (i.e. less to focus upon). Improved formatting and simpler column headings. Further identification of the applicant/pupils details that are linked to contacts (i.e. inclusion of unique pupil number). The list of checks displayed at the end of the diagnostic process will now display “Check 99” in black text were no issues have been found and in red text where one or more issues have been found. This brings Check 99 into line with the other diagnostic checks. NEW FEATURE: The diagnostic check now includes contacts where the applicant/pupil has a different address to that of the contact (such as social workers/divorced parents). When our consolidated patches are available, schools should apply patch 24203 where the Spring Release 2018 is in use, or patch 24212 where the Summer Release 2018 is in use. NB: We will be taking a slightly different approach to delivering the changes outlined above and it is now our intention to release on Friday 17th August a new patch and associated guide for the SIMS Spring and Summer releases. This is subject to the satisfactory completion of our testing and UAT processes. Added 14/08/2018 at 14:30 – CTF matching incident – Precautionary measures for SIMS Modules using contact data. It is our intention to release on Friday 17th August a new patch and associated guide for the SIMS Spring and Summer releases. This is subject to the satisfactory completion of our testing and UAT processes. This patch will need to be applied by all customers. Capita hosted SIMS customers will be updated out of hours on the day of release. This patch will update the diagnostics tool (covering incorrect links for contacts who did not live at the same address as the pupil, for example social worker/divorced parents) and ensure the CTF import is working as expected. This new patch must be applied, diagnostics undertaken, and manual fixes completed before the SIMS Modules can be reactivated. Following the release of the consolidated patch schools will be able to reactivate directly their SIMS Online Services listed above through the Product Admin Site (https://admin.sims.co.uk). Schools will be asked first whether they have completed the data clean-up and will need to acknowledge they are happy to reactivate their service. Similarly, schools will be able to reactivate Agora through its admin site (https://www.simsagora.co.uk). Schools should only use InTouch (SIMS text and email module) for generic communications to parents and contacts. Any communication which contains specific pupil information should not be sent until the schools are confident they have validated their pupils’ contact data. Further communications will be provided when the patch is available for release or additional guidance need to be given. We expect to be able to make this improved version of Check 99 available at the close of business on Wednesday the 8th August via two consolidated patches. Consolidated patch 24203 should be applied by schools who are using our Spring Release 2018, while consolidated patch 24212 should be applied by schools who are using our Summer Release 2018. As you know, for all schools that have upgraded to the SIMS 7 Summer Release 2018, CTF Export uses the format for CTF 18 instead of CTF 17 from the 1st August. My normal procedure would be to reflect this in the My Account notification area by making the newsfeed for CTF 17 unavailable. However, this year I will leave this newsfeed for CTF 17 available so that all items related to our problem with CTF import of contact data is kept available from a single newsfeed. I have added a link from this newsfeed to the CTF 18 newsfeed and I have also added a link from the CTF 18 newsfeed to this newsfeed. Check 99 (and its counterpart for DbDiagnose EXE) is very thorough in that it will report on problems with contacts for applicants even when those applicants are also enrolled as pupils at the school. We believe that this approach is in line with quite a strict interpretation of data protection regulations, but we understand that at this stage some schools and support units would appreciate the option of being able to use a variant of check 99 (and its counterpart for DbDiagnose EXE) where issues that relate to applicants that are also enrolments pupils are excluded from the scope of the check. With the above in mind, we are looking into providing a reduced scope variant of check 99 (and its counterpart for DbDiagnose EXE). If we decide to go ahead, the change for Database Diagnose would be provide via a database patch (which would be made available from SOLUS) and the change for DbDiagnose EXE would be provided via a script (Please contact us or click here). We expect this ‘variant’ to only be of interest to a minority of schools and, with that in mind, the full scope of check 99 will be adopted for the Autumn Release 2018. A detailed FAQ document covering the recent CTF Import issues experienced by some of our customers has been made available from – UPDATED SSUs – How to Identify and Correct Data Impacted by the CTF Import Incident– this will address your questions and provide clear guidance on next steps. Please note that from the SIMS 7 Summer Release 2018 onwards CTF Import cannot replace an existing contact address with an address from the CTF file. The only circumstances where the contact address in a CTF file will be written to a school’s system is where the contact did not previously exist in the school’s system or where the relevant contact in the school’s system does not already have an address. Please note that patch 24157 has been uploaded to SOLUS and made available to support units for application on systems at the Autumn Release and those upgraded to the Summer Release. The patch adds check 99 toTools | System Diagnostics | Database Diagnostics to identify definite and likely problems with a school’s contacts and contacts addresses that are likely to have been caused by our contact/address bug. The reporting of check 99 in Database Diagnostics uses the same basic structure as we have used for the DbDiagnose script and this DbDiagnose script has also been updated (version 4) on CTFContactAddressDiagnoseScriptAndInstructions so that it is line with check 99. Normally, it is only checks that fail that Database Diagnostics displays in red, but this is not the case for check 99, as this is shown in red even if the check has passed in all cases. Unfortunately, this is the ‘price we pay’ for the reporting of check 99 being suitable for copying to a spreadsheet. Where no lines are reported for check 99 failures, we still produce a header line for use with a spreadsheet and Database Diagnostics takes the header line to be an indication of a fail. We understand that this may cause some confusion, but we believe the approach to be justified in that any school with a significant number of check 99 failures will want to copy the data to a spreadsheet. Although patch 24040 has caused some further problems for some of the very small number of schools who applied the patch, it has illustrated the risk involved in attempting to fix data which could have been damaged some months ago and therefore subject to any number of changes since then. With that in mind we now plan to provide as much help as possible for schools to detect the problems, so that they can deal with their data problem using their own knowledge and judgement. With the above in mind we will be modifying the current script for the DbDiagnose application (which is run outside of SIMS .net) to provide a more focussed view of the contact/address issues that have resulted from our bug in CTF Import to an admission group. Once we are happy with this script, we will convert the logic into a SQL patch to add the check to the SIMS .net route Tools | System Diagnostics | Database Diagnostics. Providing the data check via a SIMS .net route will make the checking more accessible to schools and particularly schools with limited access to direct technical support. Patch 24157 will add check 99 to Database Diagnostics to identify definite and likely problems with a schools contacts and contacts addresses that are likely to have been caused by our contact/address bug. This patch is in the final stages of testing and we expect to be able to make it available in the near future. I would like to apologise for the original bug in our software that triggered the data problem and the amount of time it is taking us to provide an acceptable solution. I am very sorry to have to report that patch 24040 has been withdrawn. A customer case has revealed a situation where the patch can assign incorrect addresses for a contact. Dealing with this issue is our highest priority. Our initial investigation of the issue with the patch suggests that the problem is confined to situations where schools have attempted to deal with the contact/address problem ‘manually’ before applying the patch. For example, the patch may malfunction where a school deleted data and then re-ran the CTF Import before applying the patch. We understand that application of the patch has made the changes proposed by the diagnose script, so schools that did not agree with the changes proposed by the diagnose script will not have applied the patch. As you would expect, it is safe to continue to use the contact/address script, but the indication of where a data fixing patch should be applied may not be accurate. We understand that some schools are having problems when importing assessment CTF files that were downloaded from a government website. Our investigations indicate that the problem is caused by the CTF filename being ‘corrupted’ on download. When a file of the same name already exists in an internet browser’s download folder the browser often adds something to the end of the filename to differentiate the files, e.g. (1) or ~1. The spurious characters at the end of the CTF filename will need to be removed for a successful import into SIMS. As many of you will know, there was a problem with a contact matching in CTF Import to an admission group provided by our SIMS 7 Autumn 2017 and Spring 2018 releases that could result in new pre-admission pupils being linked to the wrong contact and can also result in contacts being allocated incorrect addresses. Please accept my apology for this mistake in our software. The SIMS 7 Autumn Release 2017 included a patch for CTF Import that has a serious issue where CTF Import is used for adding pupils to an admission group. On import, the software uses a matching routine to check if any of the pupils to be imported have contacts that already exist in SIMS and, where this is the case, links that contact to the pupil and updates the contacts address as necessary. Unfortunately, several aspects of the matching routine where accidentally removed so that the matching routine only checks for matching names and gender. The net result is that existing contacts can be given the wrong address and the imported pupil in the admission group can be linked to the wrong contacts. This is similar to the first aspect of the problem, but applies where no address for the contact has been included in the CTF file. As for the first aspect of the problem, the link from the imported pupil will be to the first existing contact with the same name and gender, but in this case the address for that contact is not changed. Having upgraded to the SIMS 7 Autumn Release 2017 or Spring Release 2018, a school runs Routine | Data In | Import CTF. School chooses ‘Add data for New Pupils Only’. Having selected the CTF file, the user opts for placing the new pupil in a Pre-Admission Group. Pupil named Paul Smith is added to a Pre-Admission and the software looks in the SIMS list of all contacts to find Paul’s contact whose name is John Smith with a gender of male. The software finds the first male John Smith in the list, which given the commonness of the name is likely to be the wrong John Smith, and links that John Smith as a contact for the Paul Smith that has been added to the Pre-Admission Group. Where the CTF file includes an address for the contact, the software compares the address of the John Smith in the CTF file with the John Smith that has been linked to the Paul Smith that has been added to the Pre-Admission Group and, in nearly all cases, finds that they are different. Having found that they are different the software changes the current address for the contact (which is very likely to be the right address) to the address in the CTF file (which is very likely to be the wrong address). Therefore, the Paul Smith that has been added to the Pre-Admission Group is very likely to have ended up linked to the wrong John Smith. If this John Smith has been given the wrong address, that wrong address will be significant to both Paul Smith and any other pupils where John Smith is the contact. Patch 24068 has been provided to customers via SOLUS 3 to fix the mistake in our coding (this replaced patch 23971 which only fixed part of the mistake). Patch 24068 has been included in the SIMS 7 Summer Release 2018 to ensure that the coding fix is in place for all customers. A diagnose script has been provided via My Account to help school identify problems in the contact linking and contact address area. The diagnose script is now at version 3, but all versions are suitable for use when deciding whether or not to apply patch 24040, with the only difference between the three versions being that the later versions are easier to make use of as they are better at excluded data that has already been dealt with manually. A presentation has been provided via My Account to help with making use of the said diagnose script. The My Account link now takes you to version 1.1 of the presentation, which includes a description of each type of ‘Potential Issue’. You can check if you have version 1.1 of the presentation as the version number appears in the top right-hand corner of the first slide. Patch 24040 has been developed to automatically resolve many of the data problems caused by the bug and is available to local support units via SOLUS. The patch is described as “DO NOT USE unless you are happy with the address proposed by the CTF Contact Address Diagnose Script” as a small number of schools have disagreed with the changes proposed by the Diagnose Script and such schools should not make use of this patch as the patch will put in places the proposals made by the Diagnose Script. We believe that the proposals made by the Diagnose Script are correct, but if a school disagrees they should not make use of the patch. We are sorry that this patch took longer to develop and test than originally expected, but I can assure you that this work has been treated as our number one priority. Applying Patch 23971 will fix the first aspect of the bug (available from SOLUS 3). Optionally, make use of a routine, which we expect to be able to provide in the near future, to detect if any of a school’s contact data has been affected by this bug. We expect to be able to make patch 24040 available in the near future to restore the original address for the contacts and to link the imported pupils to the correct contact. However, it is important to note that this restoration will only be possible where the school has not already attempted to resolve the issue for a contact. Unfortunately, there is a problem with our coding of CTF Import which results in any Proficiency in English data not being imported. The problem is solved by patch 23974, which is being made available from SOLUS. Where a pupil is imported into SIMS, when they already have a sibling at the school and the siblings have the same contacts, the addresses for the contacts are ended on the date of import. Where the pupil is set to ‘inherit’ a contact’s address the address for that pupil will also be ended. Currently we have a tick box that schools can use to indicate whether to export/import contact data. There has been some discussion of extending the choice to export/import of parental contacts only, e.g. Please raise/support a Change Request on My Account, if you would value such an extension of CTF functionality. Unfortunately, there is a problem with our coding of CTF Export that can result in the service child indicator being assigned to pupils in the CTF file that are not actually service children. A patch to resolve this problem will be made available from SOLUS 3 in the near future. Unfortunately, in the original SIMS Summer Release 2017 there was a mistake in the coding for selecting pupils for CME files which meant that the System Date was used where the Effective Date should have been used. Most of you will not have experienced this problem, as Workstation Patch 1 dealt with this problem as one of the CTF pupil selection fixes. I apologise for not making this clear earlier. A new version of this PowerPoint demonstration was uploaded to My Account on 15/08/2017 at 12:20. Version 2.1 corrects a mistake regarding the inclusion of Grounds for Removal in CMJ files. Version 2.0 includes extensive improvements to the presentation, which now includes slides for each of the following areas. *1 Will be introduced by SIMS 7 Autumn Release 2017 in line with the change to the DfE specification for CTF 17. CTF stands for “Common Transfer File”. This is the mechanism used for loading new pupil applicants and transfers from other schools into SIMS. Incorrect matching of applicants and on roll students imported by CTF into your SIMS7 database may have linked new pupil records to an existing contact. Additionally, some data on the existing contact record may have been changed. Will this issue have impacted my school(s)? Not all schools will be impacted. If your school does not use the CTF process you will not be impacted (this can be checked in SIMS CTF log, from Routines | CTF Import | View History Log). You will not need to take any further action. If your school uses the CTF process you must complete steps 1 to 4 (described below). Your school may still not have been impacted, but you must follow the process outlined nonetheless, to confirm whether you have been impacted and respond accordingly. Under what circumstance would my school(s) be impacted? This would happen if a combination of the name, title, gender and relationship of a pupil’s contact record in the CTF matched the same elements of the contact of another applicant, on roll pupil or leaver already held in your database. In this instance as both pupils have a parent called Wendy Bradshaw, identified also as being Female and with a relationship of Mother, the new CTF applicant would be linked to the original Wendy Bradshaw. The original Wendy Bradshaw address, telephone number and email would also be updated with the new/different Wendy Bradshaw’s details. Which data may have been altered? Address, phone number and email address fields on the contact record may be incorrect. The following description is a summary of this. As part of the patch (applied in Step 1) an extra check “Check 99” has been added to Database Diagnostics which is run from within the SIMS. “Check 99” will output data identified as possibly incorrect. If the diagnostic tool (Check 99) has not identified any actions to take, you can skip this step (Step 3) and complete Step 4. Deploy via Solus the clean-up patch 24213 or contact your usual SIMS support team. This script will clean-up back-end applicant data associated with step 3. Any staff member attempting to run a CFT export/import will be challenged in SIMS as to whether they have completed step 1 to 4 described above. It is imperative that your school has completed these steps before any further CTF imports are run. On login to SIMS a reminder splash screen will draw your (and other administrative and key staff’s) attention to the CTF issue. This reminder screen will be removed only once it has been confirmed on the CTF explore/import page that your school has completed Steps 1 to Step 4. If I need help implementing patches, running diagnostics or making changes, who can I speak to? Your usual SIMS support team will be able to help you with these processes. I write with an update on arrangements for the support of exams download days. Please pass this information on to your school’s examinations officer as I may not have their contact details. The OSMIS Service Desk will be open from 7am on download days. As the volume of calls is difficult to predict (depends on factors outside our control), we ask that you log calls for support via email wherever possible (support@osmis.co.uk) and provide a direct dial number on which we can call you back on. Logging calls in this way will mean that we are able to prioritise calls appropriately and are able to provide a solution at first contact in more cases. Of course 01618831290 is still there but we ask for your support in ensuring that we manage the load and deliver the best service possible at this busy time. Do I Need to Apply the SIMS Summer Release? If the school is not making use of PI functionality in SIMS (using SISRA, Datasec or similar), then the SIMS Summer Release is not required to download results to the SIMS system. Are There Any Database Patches I Need to Apply? This patch corrects an error when calculating the Attainment 8 figure for a student who has only taken two single sciences. This patch updates the Assessment Manager Exams Gradeset JC 41 to the correct values (this gradeset is commonly used for double Science awards). Applying patch 23539 will update Exams JC Gradesets JC 40/2 Result and JC 44/2 Result and enable the import of 9-1 short course basedata. If you have any concerns regarding the download of Exam Results, then please don’t wait – log a call and we’ll be in touch to assist. With the start of the summer holidays the Connect-Up help desk will now be operating at a reduced level, this is due to staff members taking holiday and also major work projects. We hope you understand and wish you a peaceful and happy summer.